Who doesn’t love a good crafts project? I’m no longer much for things requiring pipe cleaners and a half-pint milk carton, but I do enjoy playing while ostensibly making a thing of beauty and/or utility. I have two sets of Elder Futhark runes (a gorgeous amethyst set from Wren, the talented maker at Wren’s Runes – I also have her amazing Lymirian Oracle, but that’s for another day; and, of course, the set that came with Ralph Blum’s book, because who didn’t have them at some point?). I have a devastatingly beautiful and intensely magical set of hand-carved Futhorc Runes from Raven Kaldera and the good folk of Cauldron Farm. So, what I really need is a rune set that includes the Elder Futhark, the Younger Futhorc, and some random medieval German and Dutch runes, which, according to Nigel Pennick, were probably used only for magical purposes, and not for divination. However, I really like the shapes, so I decided to make a set of all 41 runes. 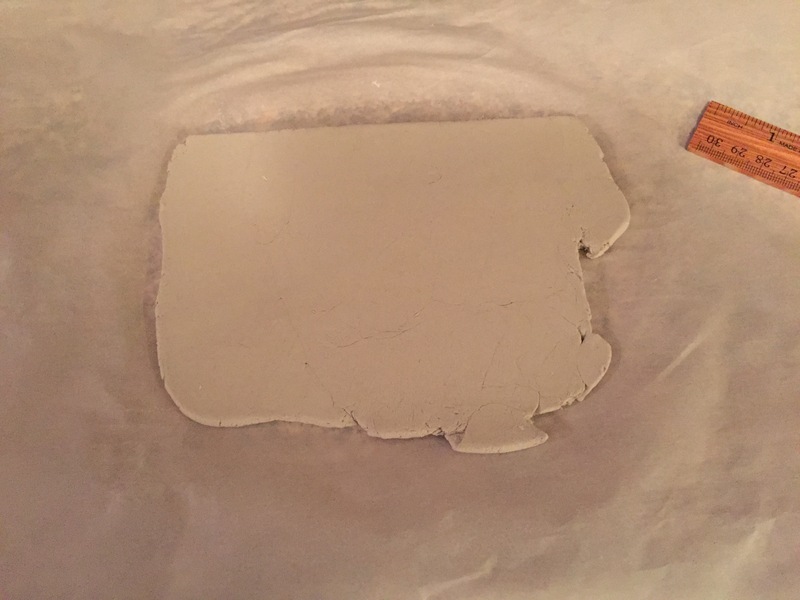 My original plan was to use Sculpey, but my local craft store had Prang Das Clay in stock, so I picked up a two pound block. As it turns out, two pounds was far more than I needed-the 41 runes took about a half pound of clay. 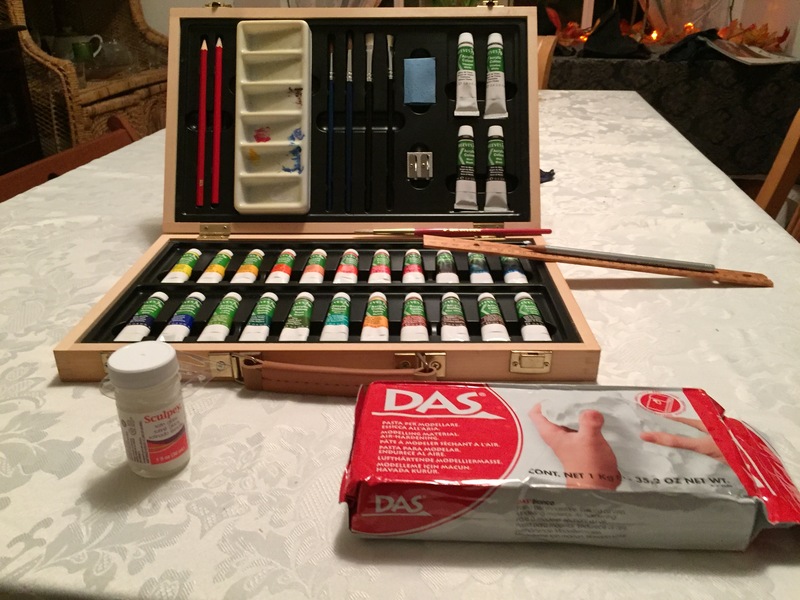 Das clay is an air dray clay, whereas Sculpey is a heat drying clay. Das is also a more fibrous clay, so it has a more organic feel. Take the usual crafting precautions–make sure you have all of your supplies, clear your workspace, wear clothes that can get messy, etc. 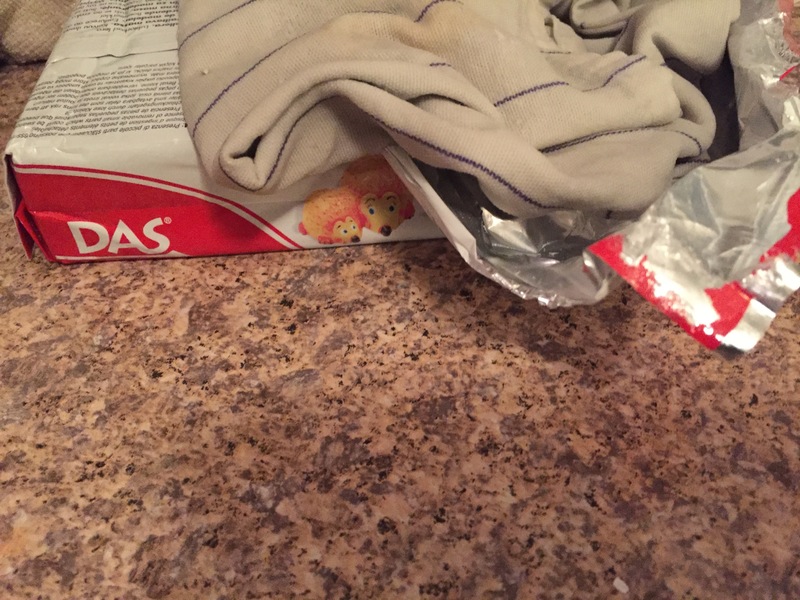 I used a regular non-stick rolling pin and a dough cutter, just like baking cookies. I did all of this on my kitchen counter, no special equipment or set up. 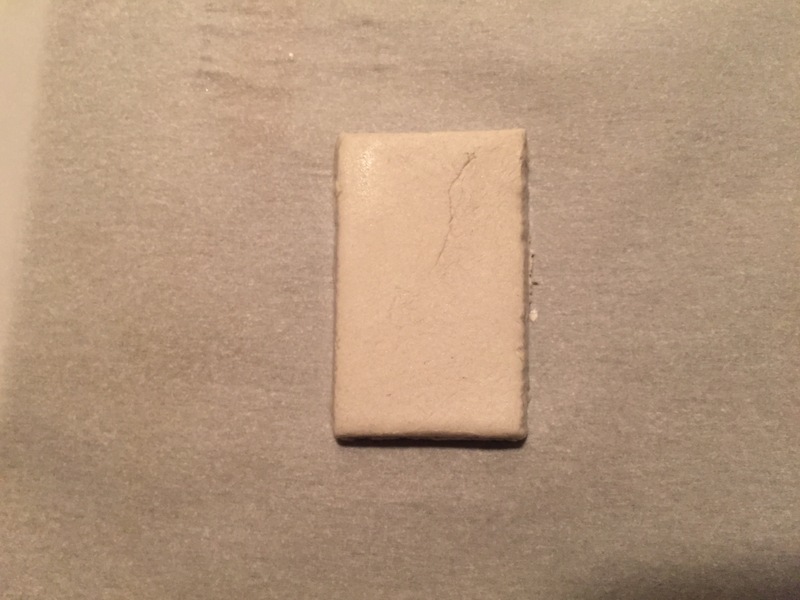 The first step is to roll out the clay so you can cut the runes from it. Just like baking, you cut a block of clay, work it with our hands and shape it into a ball, then roll it flat. 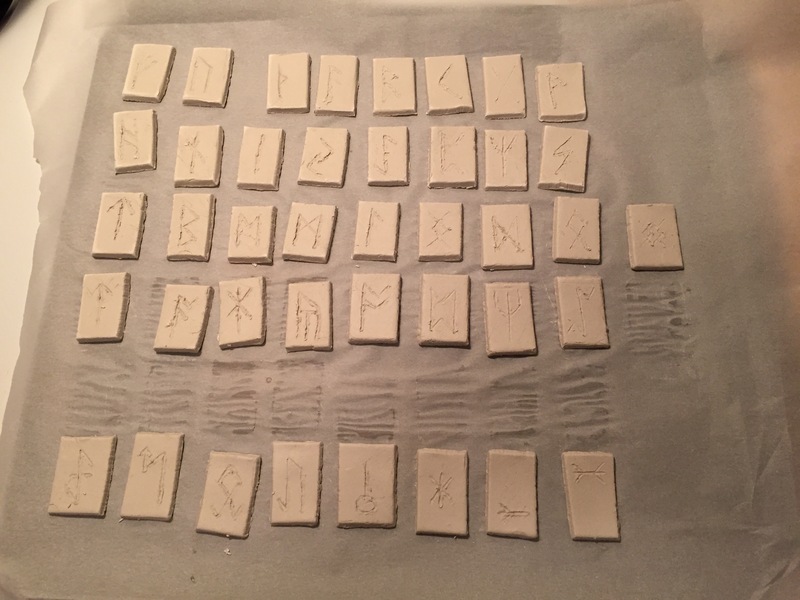 I made my runes about 1/4″ thick, as the clay shrinks just a bit when drying. I want the runes to be solid and easy to handle without breaking. Keep the rest of the clay soft while you are working by covering it with a damp towel. 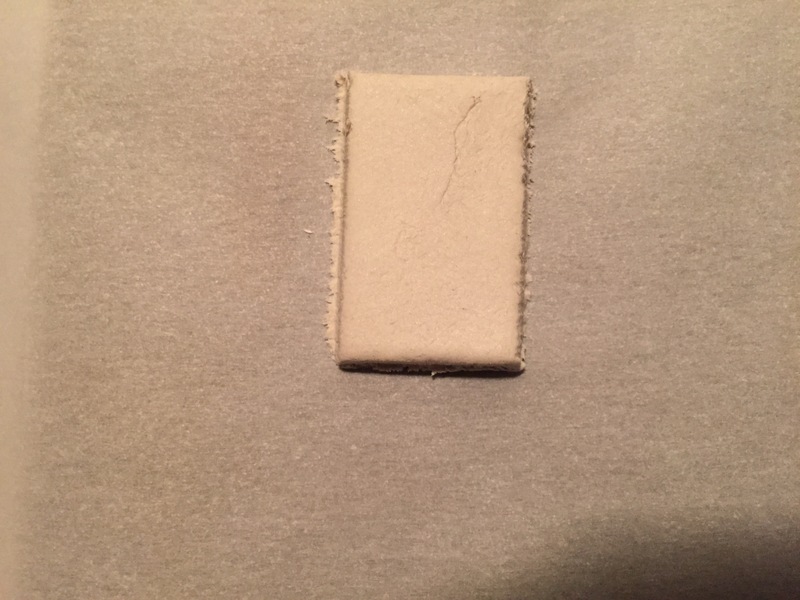 This is air-drying clay, and wow, does it dry. 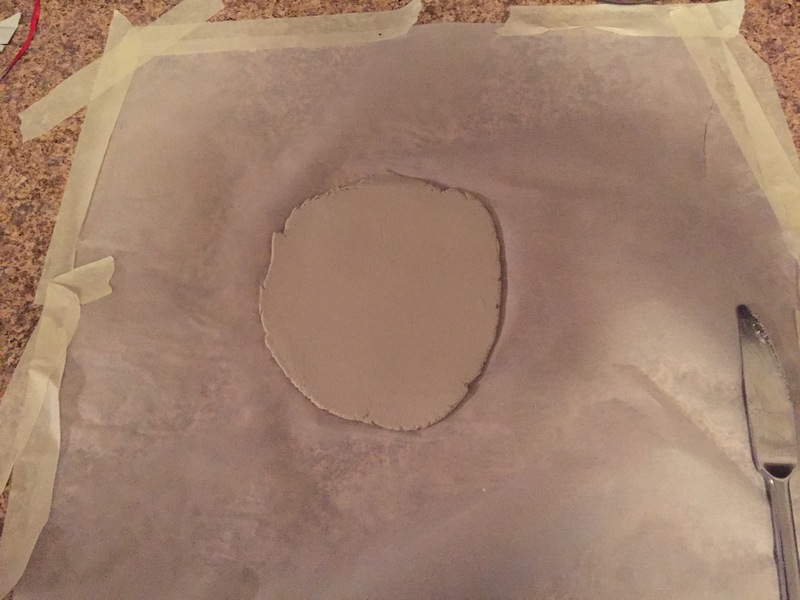 Once you’ve rolled the clay, cut off the top edge of the circle to create a straight line. I used toothpicks to draw light lines across the clay. I use a ruler to make it easier–I am not one of those people who can just look at something and cut it perfectly. 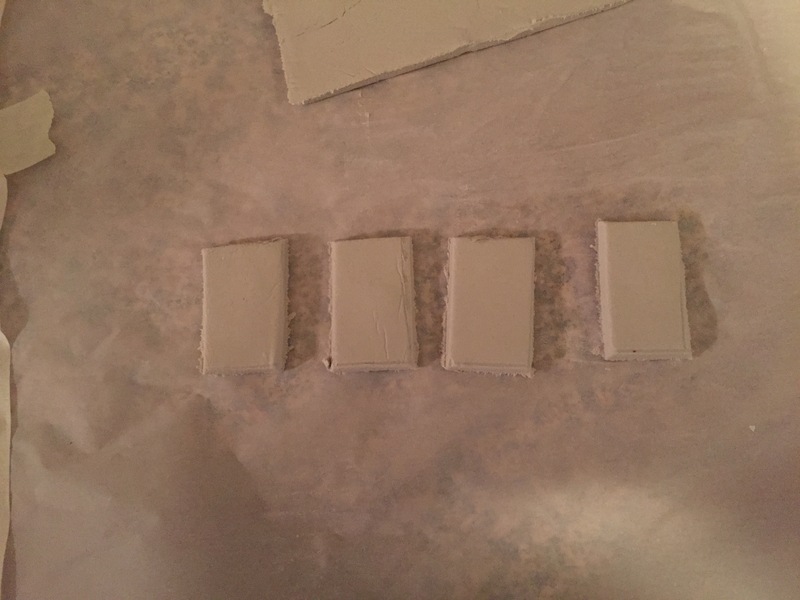 Next, cut one row from the clay to make the runes. 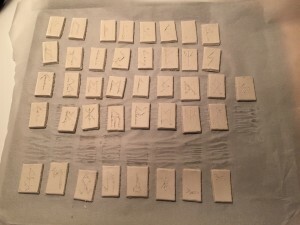 I made my runes 1.5″ tall and 1″ wide–easy to measure, and a good visual and tactile proportion. Cut one horizontal row. Did I manage to get a picture of that? Well, no. But you know what the word “horizontal” means, so I have faith in your ability to imagine what it looks like. Put the rest of the rolled out clay on the wet cloth that’s covering the main block of clay. 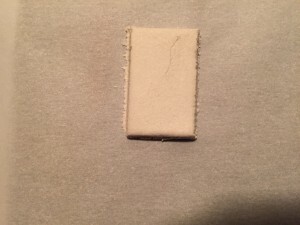 Put it face down onto the cloth, as that’s the edge you’ll be cutting and drawing on, so you want it to stay flexible. The edges will be rough from the cuts. Dip your finger in water, and smooth the edges. I will be painting my runes once they’re dry, but since my freehand drawing skills are about as good as my freehand cutting skills, I used toothpicks to carve each shape into the tiles. 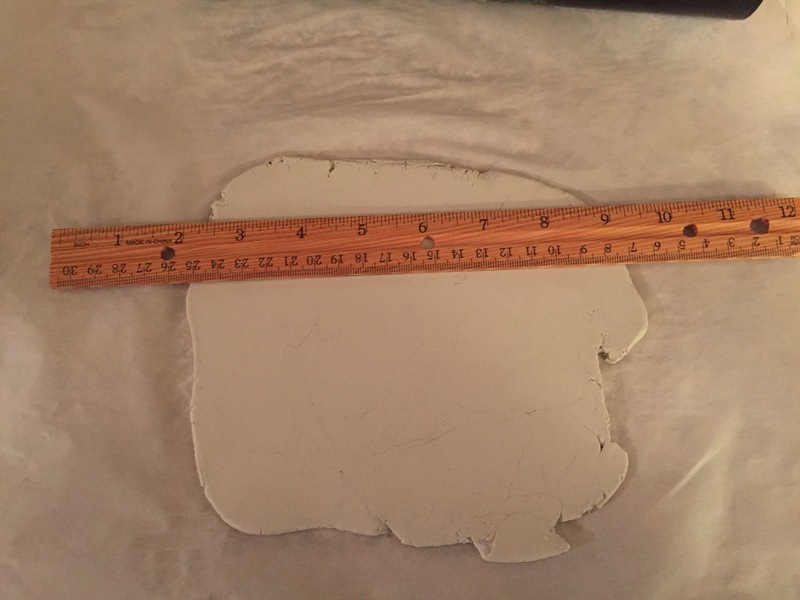 A few times, the hand did not do what the brain intended, so that particular tile went back into the clay pile. 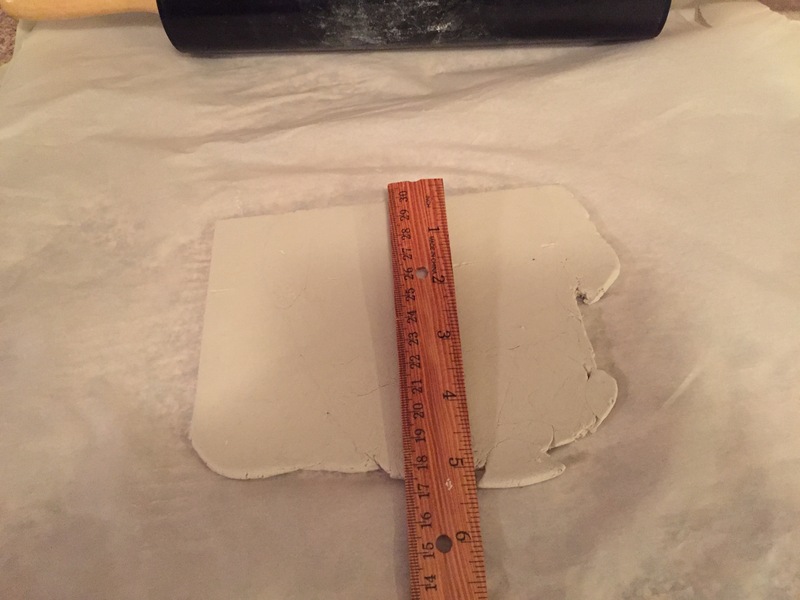 However, that’s much easier than to fix a bad paint job once the tile has dried. Dipping the carving end of the toothpick in water helped make cleaner lines. Because the clay has a fair amount of pulp in it, it pills as you trace in it. 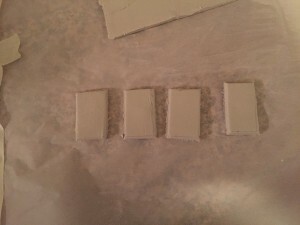 I was able to ease most of it off the surface, but a bit of sanding will be in order once they have dried. 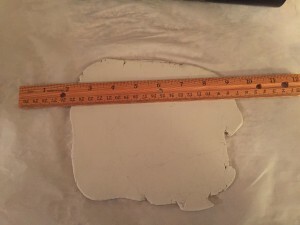 The instructions say it can be sanded with a basic emery board, so I won’t have to go all the way across the back yard to the garage to get the sandpaper. The whole process, including clean up, took just under two hours, and there’s not a trace of clay or disarray in my kitchen. 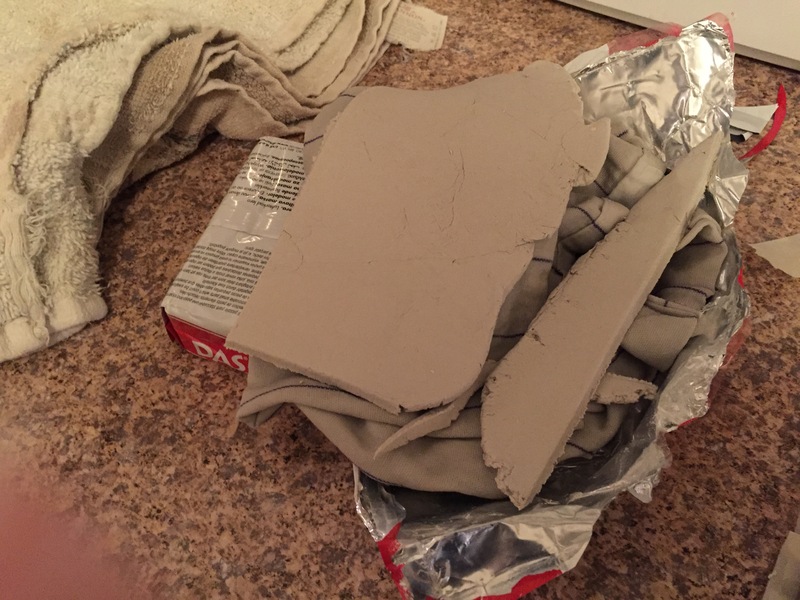 The instructions say that the clay will be fully dry in 24 hours. We’ll find out! Then it will be time to paint them. Stay tuned!